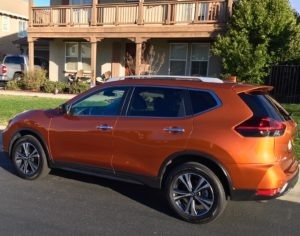 Two years ago, the Nissan Rogue received a refreshing that enhanced its appeal. But the biggest addition was adding a hybrid model in addition to its three trim (S, SV and SL). The Rogue possesses most of the key qualities that car buyers desire in a small crossover SUV, delivering an upscale cabin with good comfort, spacious room for five occupants, excellent cargo space, and an alluring sticker price. It doesn’t seem to matter that the Rogue’s overall performance is lacking and several competitors provide a better driving experience. Two years ago, the Nissan Rogue received a refreshing that enhanced its appeal. But the biggest addition was adding a hybrid model in addition to its three trim (S, SV and SL). Although possessing the general characteristics of the traditional Rogue, the hybrid’s gas mileage (31-37 mpg) is quite impressive. Weidel on Wheels is featured periodically on this website – www.tahoeskiworld.com. Auto writer Jeffrey Weidel can be reached at skiweidel@gmail.com. Follow him on Twitter at @jeffweidel.